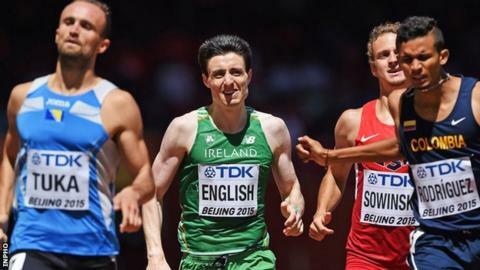 Mark English has failed to make the 800m final at the World Championships after finishing fifth in his semi-final in Beijing on Sunday. The Letterkenny athlete ran an impressive 1:45.55, which was the 11th fastest time in the semi-finals. English's run was also over a second quicker than his time in Saturday's heats at Beijing National Stadium. The 22-year-old progressed to the semi-finals as a fastest loser from the heats, where he clocked 1:46.69. A back injury severely inhibited English during the early stages of his summer campaign. The UCD runner finished out of the medals at the European Under-23 Championships in the early part of July. Irish 400m hurdles star Thomas Barr also missed out on a place in a final after finishing fourth in his semi-final. Waterford man Barr, 23, ran 48.71 on Sunday, an improvement on his 49.20 in Saturday's heats. Meanwhile, Ciara Mageean improved her 1,500m personal best to 4:07.33 when she took victory at the British Milers Club meeting in Solihull on Saturday night. The Portaferry woman, who is chasing Olympic qualifying time of 4:06, cut .12 off her previous best set in 2011. Mageean opted to miss the Worlds despite being offered a place.